I’ve been sick for the past couple of days. I must’ve caught something from the kids. Normally, when you are sick, you stay in bed or take some time off. Well there’s nothing of the sort for me. I thought yesterday would never end; I was nauseous and dizzy while A2 was hanging from my neck like a monkey the whole evening. They warn you about pregnancy’s morning sickness but nobody tells you how much you’ll really be throwing up once you become a mom. From pregnancy to day care germs, you’re bound to find yourself face to face with the inside of that toilet quite a few times. If you think that’s disgusting, let me mention the horrible feeling of the toilet water splashing upwards onto your cheeks…or even worse into your open mouth. Now imagine all this in a public bathroom. Been there… and the memory is still so vivid. Mommy throwing up is not a big deal in this house anymore. I threw up for the first six months of all my pregnancies. Basically I’ve been crouched over the toilet for the past three years. I’ve even spent nights on the bathroom carpet. 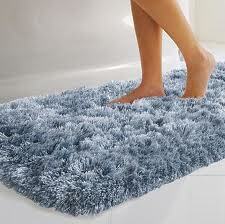 I suggest planning ahead and investing in a really fluffy bathroom rug before starting a family. It will offer proper cushioning for your knees not only while you hurl but also while you bathe the children kneeled by the bathtub. It can later offer you comfortable seating when your child is sitting on the potty asking you to hold their hand while they push for #2. Four months into my third pregnancy, A2 could answer to “What sound does mommy make throwing up?” before she could even answer to “what sound does a dog make”. I can remember a time when it was a big deal. When I would get sick during my first pregnancy, Jack would hold my hair and hold a damp towel to my forehead. Things changed with the second pregnancy, he would still come into the bathroom to check on me and ask if I needed anything. Third time around… he abruptly opened the bathroom door and complained about how I was going to wake the kids with all the noise I was making! Poor Jack, I make him sound so heartless. P.S He’s not heartless. He’s awesome. ROFL! You know, bathroom rugs are something that we’ve probably all thought about while in the throes of illness, but then immediately forget once we are better. They should put this post in the pregnancy books! Thanks for following my blog! I’ll be following yours as well!